Being the well known name to deliver excellence, we are trusted to meet customers’ exact needs. 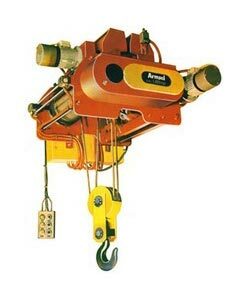 We, as a Supplier, Exporter and Importer, offer Electric Wire Rope Hoists in a variety of sizes and specifications. It guides the rope for proper seating over the grooves and is designed to prevent overlapping. Our team of expert professionals keeps quality on the top of our priority list. Some features are durability, high strength, and compact design.